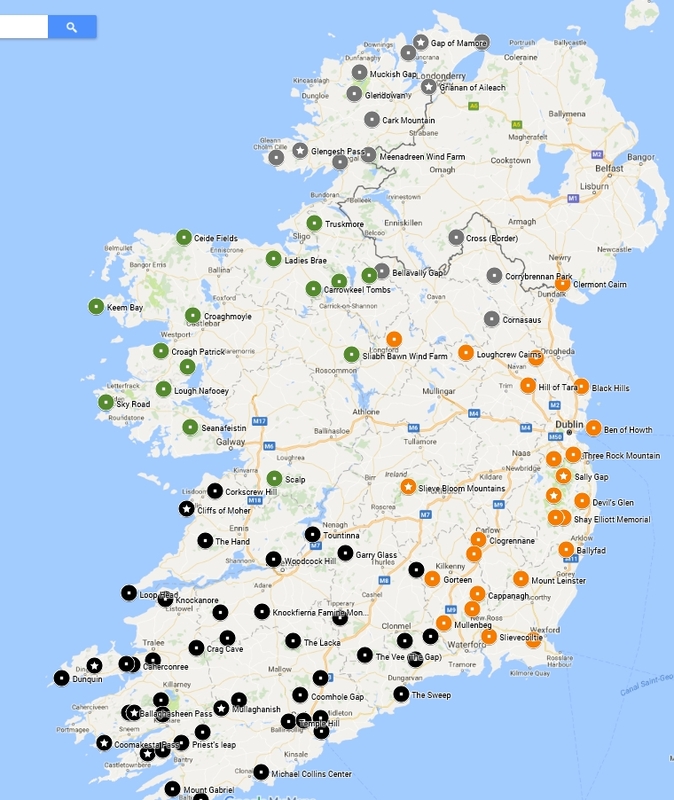 The hundred climbs have been classified in four zones, the four historic provinces well known by the rugby fans : Ulster, Connacht, Leinster and Munster. With a difference : only three out of the nine Counties (Donegal, Monaghan and Cavan) belong to the Republic of Ireland. The other six make up Northern Ireland. They will be the subject of a 25-list, to be issued later in the United Kingdom Challenge. Ireland is definitely not a country with high mountains, but it has arguments. Its highest point exceeds 1000m asl (1038m at Carrauntoohil) and the highest asphalted road reaches the Mount Leinster at 796m. The Holy Grail is to be found on the sides of the latter (last 3 km at more than 11%, with a 15% max.). It's worth 750 Europoints, more than Great Dun Fell (681 points) in England, or the already selected in the BIG Superlist Mullaghanish (531 points). 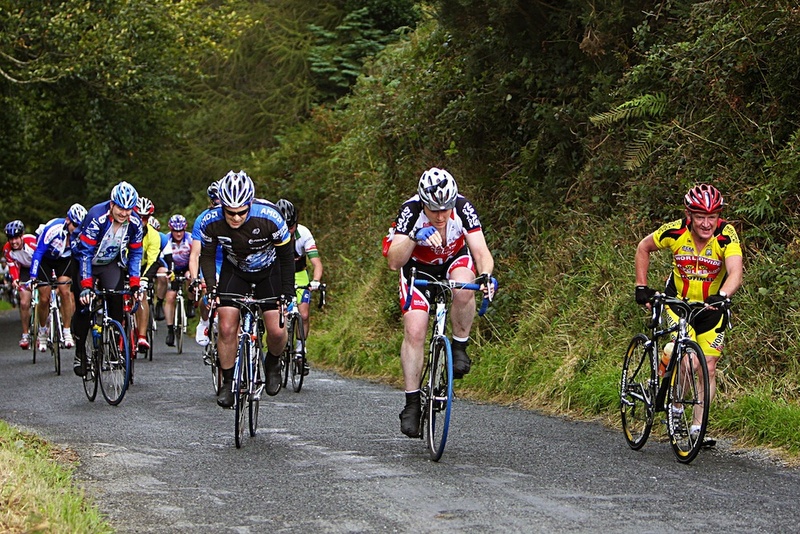 More than 10km long climbs : a few BIGs (in the Wicklow and Slieve Bloom Mts. 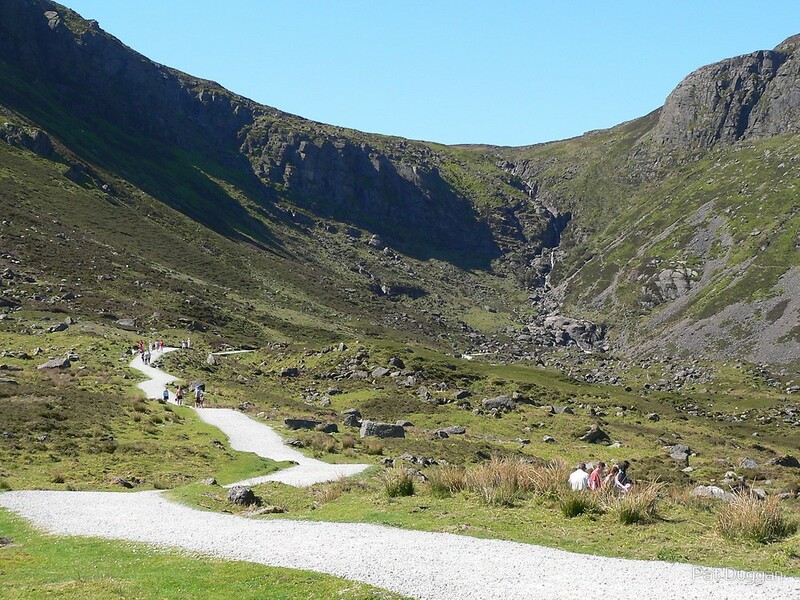 ), Glendowan Mts., Millstreet Country Park, Coomhole Gap, Molls Gap and Powers the Pot. The « mountaineers » won't find better than the 22% max. in Mamore, but steepness is obviously a property of the Irish Challenge. 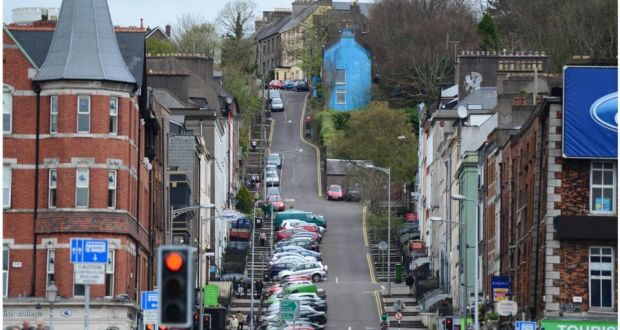 The Top 5 is completed by the 21% in Rooska, renowned for its Hill climb, the 20% in Temple Hill, the 17% of the urban wall St Patrick's Hill in Cork. Let's also keep in mind the very remote 19% in the Gougane Barra National Forest Park. All in all, 2/3 of the 100 climbs have a maximum % equal to or greater than 10%. And the five greatest elevation gains : Leinster of course (750m), Truskmore (596m), Mullaghanish (516m), Clermont Cairn (474m) and Priest 's Leap (445m). Without compromising on difficulty, the Irish Challenge pays a lot of attention to natural and cultural places of interest : 30% of the climbs have a green triangle, that announces the presence of a place of interest in the climb or at its top. To be highlighted a few potential UNESCO sites (The Céide Fields, the Burren and Tara Complex), as well as the six official National Parks. Five out of the six are represented : Glenveagh (Muckish Gap and Glendowan Mts. ), Connemara (Lough Nafooey), the stone desert in The Burren (Corkscrew Hill), the Wicklow Mts., south of Dublin (Wicklow and Sally Gaps), and Killarney (Gap of Dunloe and Molly's Gap). Seashore landscapes are many and various : the sublime Ballymastocker Beach, the Cliffs of Moher (over a million visitors annually), Keem Bay, the Sky Road, Loop Head, the deep dive in Dunquin or Ben of Howth, a lovely reverse angle shot of Dublin Bay, with the Wicklow Mts. in the background. Other examples among others : the 360-degree panorama on Tountinna, above the River Shannon, Crag Cave, the very amazing cirque around Mahon Falls, Barley Lake or the JFK Arboretum at the foot of Slievecoiltie. Some pages of history. The prehistoric period, for instance, thanks to Grianan of Aileach Fort, the megalithic tombs in Loughcrew and the Hills of Tara and Slane. Saint Patrick is the patron saint of Ireland. Every year pelgrims climb the Croagh Patrick (765m) to celebrate him. 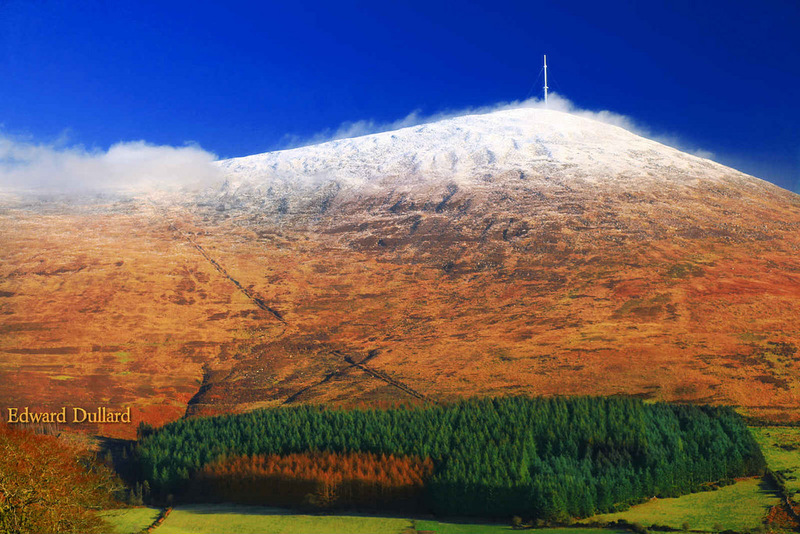 The mount can not be reached by bicycle, but Tiernacroagha (240m) allows to get closer, in the background. 30% of the climbs have the « media » label (yellow triangle). Behind Sean Kelly and Stephen Roche, the Irish cycling world is alive and well. 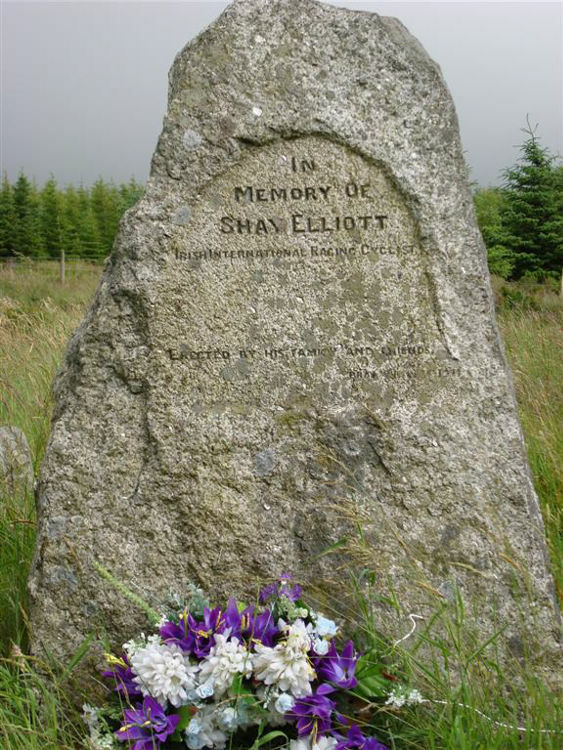 At the top of Drumgoff, an engraved stone keeps alive Shay Elliott's memory, an Irish professional cyclist in the 1950-1960s. Since 1958, a race bears his name. 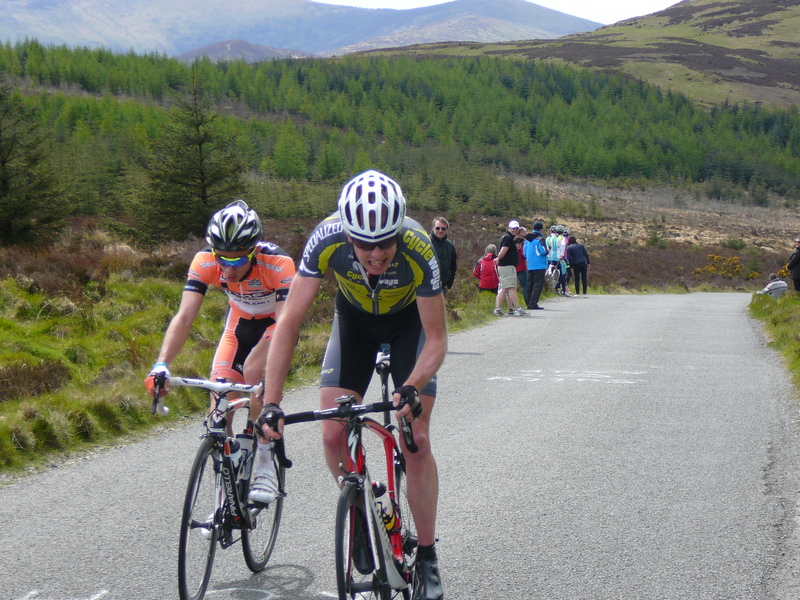 Of course it goes through this very famous climb in the Wicklow Mts. From 1985 to 1992, a Tour of Irlande was organized, under the name « Nissan Classic ». Seskin and St Patrick's Hills were very often among the « Kings of the Mountain ». Also a very amazing Cairmont Cairn, in which Roche, Breukink and Armstrong battled for the victory in 1992. 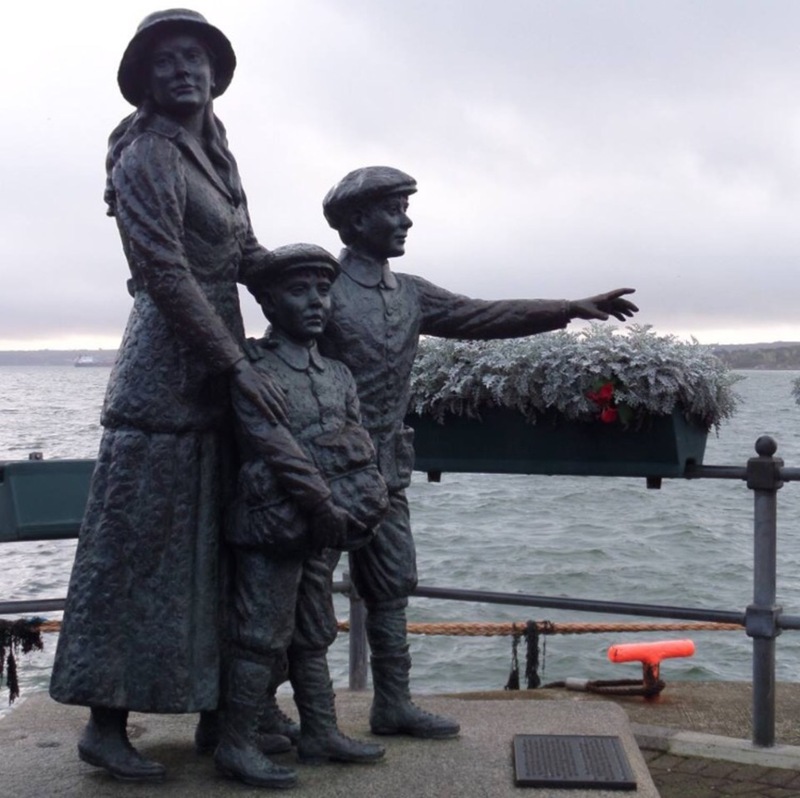 Since 1953, another race criss-crosses the island, under various names : FDB Race, An Post Rás and, since 2018, Rás Tailteann. 25 climbs of the list were KOM : the big western gaps, of course, Mamore, Mount Leinster and Seskin Hill, for sure. Some less famous « 1st category » : The Butts, Clogrennane, Slieve Man, Gorteen, The Maum, .... And the classic final loop in Skerries, on the Irish Seaside, north of Dublin, that explains the selection of the Black Hills. Another media event : the « Hill climbs », individual time trials on a single climb. Not very common on the European Continent, but wrongfully, they seem to be an Anglo-Saxon phenomenon. Competitions are organized in Ireland, at national and provincial levels. On your marks for some classic hill climbs (Mamore, Grianan of Aileach, Wicklow Gap) or some original (Rooska, Laska, Scalp, Ballyfad, Laharn). Finally, the cyclosportives. The « Sean Kelly », for instance, climbs Seskin Hill, Powers the Pot and Mahon Falls.